Use your computer, tablet or smartphone, they all work fine! 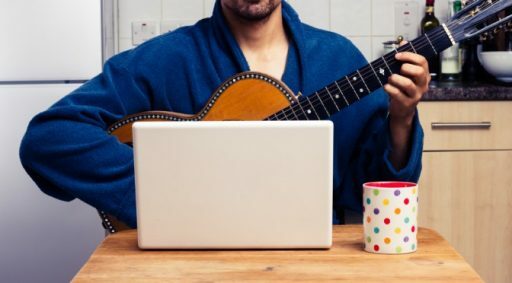 JamAlong’s live online music lessons are an opportunity to get help with anything you need, like tuning, changing a string, or setting up your computer. It’s the ultimate addition to your studies, and we’re just a call away! And we can video record any part of the lesson at any time, just say when. Then we’ll email it to you so you can study it for as long as you need. And the best part about JamAlong’s live online music lessons is that it’s all about you. Yes, you get to pick what the lesson is about. Want to learn a Bach Etude? No problem. Just wanna jam and hang out? Also no problem. Whatever you want to focus on, that’s what we’ll do. Included with a Ninja Jammer subscription. That’s right, a live online music lesson, absolutely free! To get the most out of your live online music lessons, we recommend you download and install Zoom. (It’s like Skype but easier to use). Click the button below, and then click on the first blue “download” button under the Zoom Client for Meetings heading, and follow the steps it tells you to. After your lesson is booked with us, we will send you an invite so you don’t have to worry about doing anything else. Don’t go sending us any weird invites or anything, just sit tight! Please be aware that you will need to have a minimum internet speed of at least 3 to 5 mbps in order to enjoy live online music lessons at JamAlong. You can test your internet speed quickly HERE, and if it is too low, then you will need to contact your internet provider to upgrade your package before proceeding to a live online lesson. 1) Computer – Nowadays this is a broad term, as you can do video calls just fine on your tablet or smart phone. In fact more and more of our students are using iPads to do view their lessons and do all sorts of cool music tasks like tuning, using a metronome, recording, etc. We highly recommend the iPad Mini 4, which you can purchase through us on our Music Tech page. 2) Headphones – This is pretty much a must-have item, because when you use your regular device speakers, it can create a feedback loop (read: annoying echo). Also, using headphones will preserve the friendships of those that have to live around you as you learn music! 4) Music Stand – Even in this hi-tech world of smart devices and touch screens, it is still hard to replace the good old music book. And when you are a student here at JamAlong, we also encourage you to print out the TAB and charts for your lessons, so you can have the on the music stand for easy reference as you go through our videos. So, add a music stand to your Jam Zone, it will make your life so much easier. 5) Instrument Stand – Many bad things come from leaning your instrument against the wall, and it is also not healthy to keep it locked away in a case. Why? Because you’ll play it less; this is an actual statistic. When you have your prized noisemaker gazing up at you from a stand, not only does it look really cool, but it will increase the odds that you’ll stop in passing and play for a bit. Also when you are working through a JamAlong lesson you will need to set your axe down a lot, and without an instrument stand this will get very annoying very soon. 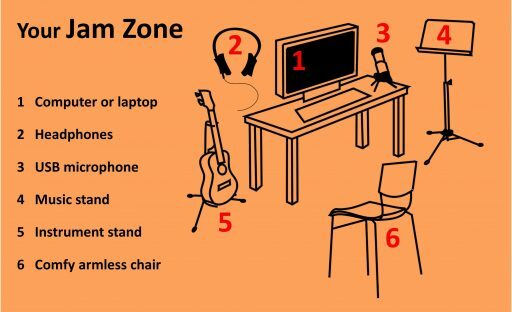 6) Comfy armless chair – This may seem like a no-brainer, but having the right chair is actually very important. First off, most office chairs have arms, and unless you are playing the flute these will get in the way. Secondly when you think of all the time you will spend sitting and strumming, it makes sense to treat your rump to a decent seat! We endorse an actual music stool like the one in our store, but when you’re sitting at your desk sometimes a stool puts you up too high. In any case, treat yourself to a decent ATGA (a** to ground adapter). So head on over to the JamAlong Music Store and order the makings for a premium Jam Zone, it will make your live online music lessons so much more fun!